Vessel selection: The Prysmian Group has chartered Global Marine Systems' (GMS) cable-laying vessel, the CS Sovereign, from mid-2016 into early 2017 for carrying out the inter-array submarine cabling at the Wikinger Offshore Wind Farm in the Baltic Sea. The vessel is equipped with two powered 2,300 tonne "basket" turntables, designed to operate at a maximum linear speed of 900m/hour. It was used for installation and burial of 80 inter-array cables at Global Tech 1, Thornton Bank in 2011, and previously Denmark's Horns Rev 2. Project online: Inauguration of the 288MW Butendiek offshore wind farm took place in Husum on 8 September 2015 with the participation of state-level politicians and Jurgen Trittin, federal German MP and former federal environment minister. The project, built at an investment of €1.3 billion, is expected to generate 1.28TWh per year, equivalent to 4,444 full load hours per year. The electricity is marketed on the wholesale day-ahead market by CLENS Clean Energy Sourcing, an independent green electricity trading company selected in a competitive tendering process. Financing arrangement: Bremer Landesbank has announced that it will contribute to financing the €410m Nordergrunde nearshore wind project. KfW-IPEX and the European Investment Bank (EIB) lead the consortium of lenders, it added. No further details were released. The 111.6MW project will be built 15 kilometres north-east of the German island of Wangerooge, and comprises 18 Senvion 6.2MW M126 turbines installed in water depths of up to ten metres. 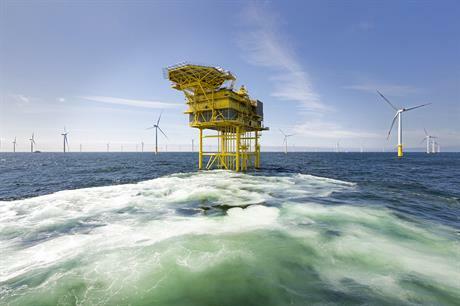 Servicing deal: Deutsche Windtechnik Offshore and Consulting (DWOC) and Vattenfall have expanded the scope of their cooperation for the DanTysk offshore wind farm. Under a four-year contract running from end-June 2015, DWOC will maintain and inspect all transition pieces and foundations above and below water level of the 80 Siemens SWT-3.6-120 turbines. It will also perform maintenance tasks for the offshore substation, accommodation platform, hydraulic cranes and latchway systems. Two teams carry out these tasks in 14-day cycles working out of the Danish port Esbjerg, DWOC said. Safety concerns: Construction of the 30MW Block Island in Rhode Island Sound has faced safety issues that developer Deepwater Wind says are now being addressed. The ABS Group, retained by the Coastal Resources Management Council to oversee construction, said there had been problems including dropped objects, loss of control of suspended loads, employees working underneath suspended loads, wrong placement of logistical safety equipment, and the reliability of a rescue skiff. Foundations contractor Weeks/Manson has limited offshore experience, noted ABS, and there was limited safety representation during operations resulting in numerous personnel changes. Also, at one point Barge 533 was not secured to a deck, there were concerns about crane and pile-driving equipment reliability, cranes were old and poorly suited to offshore use, and there was repeated failure of rigging equipment resulting in loss of a load. Deepwater says it is implementing ABS' recommendations to fix the problems. Construction started in late July.